3.1.1 State that the most frequently occurring chemical elements in living things are carbon, hydrogen, oxygen and nitrogen. 3.1.2 State that a variety of other elements are needed by living organisms, including sulfur, calcium, phosphorus, iron and sodium. 3.1.3 State one role for each of the elements mentioned in 3.1.2. 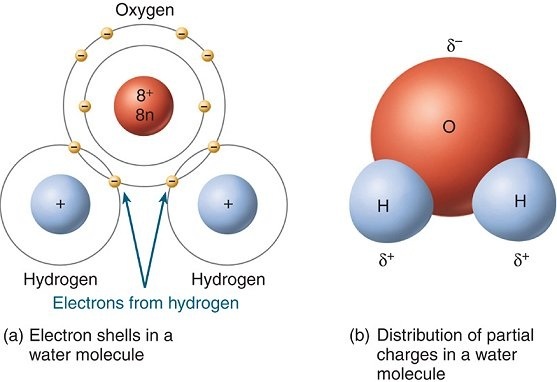 3.1.4 Draw and label a diagram showing the structure of water molecules to show their polarity and hydrogen bond formation. 3.1.5 Outline the thermal, cohesive and solvent properties of water. 3.1.6 Explain the relationship between the properties of water and its uses in living organisms as a coolant, medium for metabolic reactions and transport medium. Watch the videos and answer the following questions. 1. What do you mean by chemistry of life? 2. What are biologically important elements? Why are they called so? 3. Name four main biological elements. 3. State the role of each biologically important element. You will be working in pairs. You will need a camera/smartphone for clicking pictures for the document to be submitted. Watch the videos before coming for the lab. There are 10 water stations showing various properties of water. You have to identify the properties of each station and state how the property is significant for living organism. Water molecules are polar; this makes water a good solvent. Water can dissolve many organic and inorganic substances that contain electronegative atoms. This occurs because the polar attraction of large quantities of water molecules can sufficiently weaken intramolecular forces (such as ionic bonds) and result in the dissociation of the atoms.